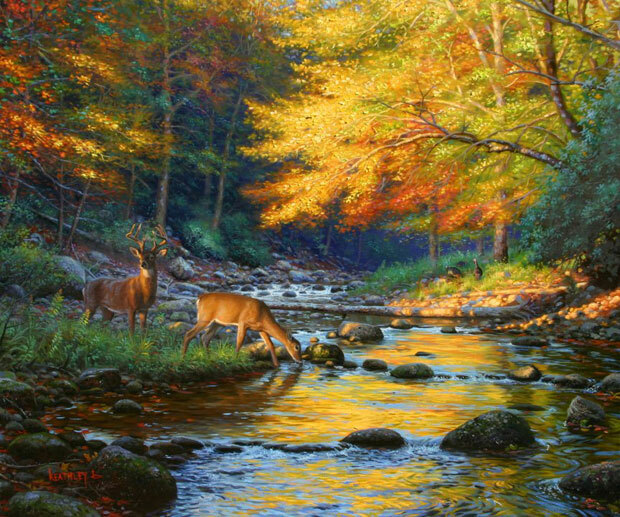 CHATTANOOGA, TENNESSEE (April 28, 2010) – Artist Mark Keathley's "Quiet Encounter" has been selected for the National Wild Turkey Federation's (NWTF) 2011 core art program. The art program helps to further NWTF's mission to conserve the wild turkey and preserve the heritage of hunting. Keathley's prints will raise funds via auctions held at more than 2200 banquets throughout North America in 2011. "I am honored that my work has been selected by an organization who is so dedicated to the preservation of our wildlife habitat", says Keathley. "As someone who spends a great deal of time in the outdoors I am thrilled to be able to participate in a program that not only conserves our public lands but invests in the environmental education that is so crucial to our future." The Texas native, whose works are available at galleries nationwide, is known for his richly textured, peaceful scenes of family and nature. "I want my paintings to inspire people to be still, to listen to that quiet voice, and then rise up assured that they are a part of something bigger than their schedule." "Quiet Encounter" does just that. As two white-tailed deer drink from a winding stream and a few wild turkeys walk beneath colorful trees, in the crisp mountain air the viewer can't help but be drawn into the tranquility of the landscape. "Quiet Encounter" is currently available as a limited edition canvas in an edition size of 195, with 25 Artist's Proofs and 75 Publisher's Proofs. The canvas measures 20" x 24" and unframed prices range from $550 - $795. Each canvas reproduction is hand-embellished to create the look of an original oil painting. The paper print edition, limited to 2500, will be used to raise funds for the 2011 NWTF auction season. All editions are hand-signed by the artist and individually numbered. For information about upcoming Mark Keathley gallery events, Keathley's newest release, "A Perfect Day", featuring Montauk Point Lighthouse, and your nearest Mark Keathley gallery, visit www.InfinityFineArt.com or call 865-436-0174. To learn more about the National Wild Turkey Federation, upcoming banquets and auctions, or to become a member, visit www.NWTF.org. About Infinity Fine Art: Infinity Fine Art, located in Chattanooga, TN, is the exclusive publisher of the work of Mark Keathley and distributes his art through independently owned galleries throughout North America. For more information and to locate your nearest gallery, please visit the company's website, www.InfinityFineArt.com. About the National Wild Turkey Federation: When the NWTF was founded in 1973, there were only 1.3 million wild turkeys. Thanks to NWTF volunteers and partners, today that number stands at more than 7 million birds in the United States, Canada and Mexico. Through dynamic partnerships with state, federal and provincial wildlife agencies, the NWTF and its members have helped restore wild turkey populations across the country, raised and spent more than $306 million, and conserved nearly 14 million acres of habitat for all types of wildlife. The Federation also works to increase interest in the outdoors by bringing new hunters and conservationists into the fold through special outdoor education events and its outreach programs – Women in the Outdoors, Wheelin' Sportsmen, JAKES and Xtreme JAKES. Visit www.NWTF.org or call (800) THE-NWTF.